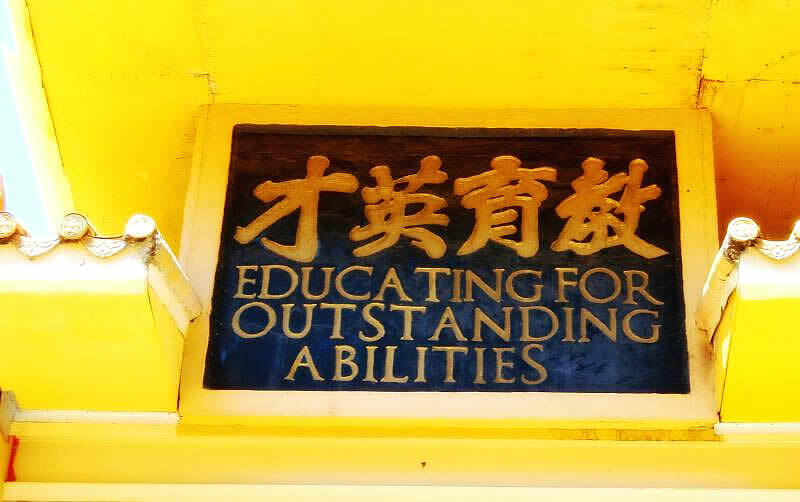 The Venerable Master Hua saw clearly that in order to save the world, the most urgent priority is to develop good education. If we want to save the world, we have to bring about a complete change in people's minds and guide them to cast out unwholesomeness and to pursue goodness. For this purpose the Master founded Instilling Goodness Elementary School in 1974, and he founded Developing Virtue Secondary School and Dharma Realm Buddhist University in 1976. The Master indicated that the elementary school should teach students to be filial to parents and respectful to teachers and elders, the secondary school should teach students to be good citizens, and the university should teach the principles of humaneness, righteousness, the Way, and virtue. Instilling Goodness Elementary School and Developing Virtue Secondary School merge the best of contemporary and traditional methods and of Western and Eastern cultures. Due to the emphasis on moral virtue and spiritual development, in addition to the required academic curriculum, courses are offered in ethics, meditation, Buddhist studies, and so on, giving students a foundation in virtue and guiding them gradually to know themselves and to explore the truths of the universe. At the City of Ten Thousand Buddhas, the elementary and secondary schools offer bilingual education (Chinese and English). Boys and girls are educated separately in order to avoid distractions and preserve their pure natures. Due to the many different cultures and nationalities that are represented among the teaching staff and student body, multiple grades are grouped together to allow students more flexibility in academic progress. Students learn to open their minds to respect and appreciate different cultural traditions. In offering an education based on virtue, Instilling Goodness Elementary School and Developing Virtue Secondary School hope to guide students to become good and capable citizens of the world, thus benefiting all of humankind. Aside from the City of Ten Thousand Buddhas, branches of the schools have also been formed at other affiliated monasteries with the aim of widely propagating filial piety and ethical education. 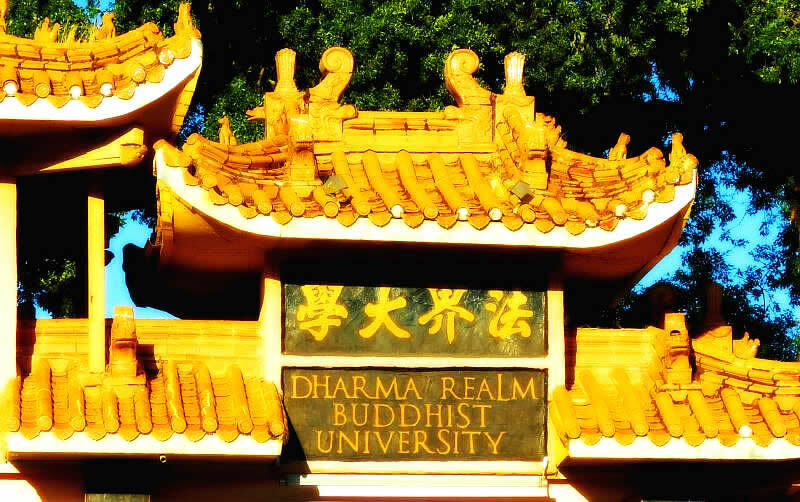 Dharma Realm Buddhist University does not merely transmit academic knowledge. It emphasizes a foundation in virtue, which expands into the study of how to help all people and all living beings return to their inherent nature. 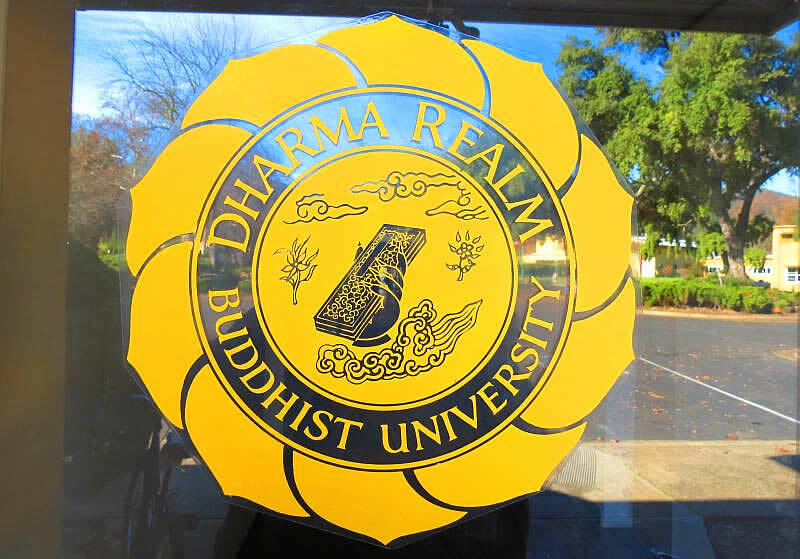 Thus Dharma Realm Buddhist University advocates a spirit of shared inquiry and free exchange of ideas, encouraging students to study various texts and use different experiences and learning styles to tap their inherent wisdom and fathom the meanings of those texts. Students are then encouraged to practice the principles they have understood and thus integrate the Buddhadharma into their lives. They will then be able to nurture their wisdom and become replete with virtue. The University aims to produce outstanding individuals of high moral character who will be able to bring benefit to all sentient beings. The content of the courses taught by Dharma Realm Buddhist University consists primarily of the Proper Dharma. Faculty and students alike see this as the goal of their efforts in study and cultivation. Everyone investigates together in order to attain the ultimate state of wisdom and compassion. In such an environment, everyone's lifestyle is characterized by rigorous self-discipline. Whether students or teachers, monastics or laity, male or female, young or old, everyone is regarded with equal kindness. There are no distinctions of class and no personal differences. Every individual and the customs of every cultural tradition are respected. Beyond the physical manifestations of students, teachers, textbooks, and classrooms, the genuine and profound hallmark of the Dharma Realm Buddhist University is its spirit of taking the Dharma Realm as its substance and the Proper Dharma as its function. There is no place that is not a classroom, and nothing that is not a learning resource. There is no time when people are not mutually honing and refining each other's characters and talents. All people, events, and objects can be learned from and constantly give us good opportunities to accumulate blessings, grow in wholesome Dharma, and perpetuate wisdom.